1. Preheat the oven to 150°C, 130° fan, Gas Mark 2. Line a baking tray with nonstick baking paper and lightly oil it. 2. Place the egg whites in a grease-free bowl and whisk until stiff. Gradually add the sugar, a tablespoon at a time, until the meringue mixture is thick and glossy. 3. Using a large metal spoon, spoon the meringue onto the greaseproof paper, making a large circle and a lip around the edge so that you have a slight dip in the middle. 4. Cook for 30 minutes before switching off and leaving the meringue where it is overnight to dry it out. 5. 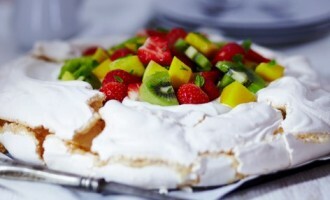 When you are ready to serve the pavlova, peel off the baking paper and place it on a serving plate. Chop all of the fruit and toss it in a bowl with some freshly chopped mint, then spoon on the Greek yogurt and top with the fruit salad.